A good movie I will forget by the end of this review. I have a couple of problems with the rollout of Everest, so I’d like to get those out of the way before reviewing the actual movie. First, the movie is being released in IMAX 3D only for one week before rolling out nationwide in conventional (i.e. non-IMAX 3D) theaters. The IMAX 3D piece implies that this movie is primarily a visual “event,” which it’s not...or at least it shouldn’t be. It’s an elegy to a group of men and women, some of whom died painfully on a mountain. It’s not a white-knuckle thrill ride. It’s a sad story about a bunch of people -- some who survived but many who died. Second, when I bought my IMAX 3D ticket I received an Everest patch with an illustration of the mountain. The patch reads “Everest Regal IMAX.” So it’s like I’m one of the people on the expedition, right? That was the intention? That’s in poor taste, Regal. 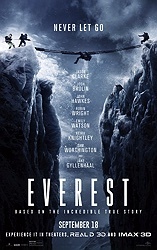 Anyways, as for the movie itself, Everest is good but forgettable, unfortunately. I saw the movie two days ago and it has not stuck with me much on an emotional level, which is surprising since this is a very emotion-rich story being told. The movie follows a climbing expedition of Mt. Everest back in 1996 that was devastated by a snow storm. The ensemble cast is playing the real people who took part in the tragedy. The cast is led by Jason Clarke in, what is becoming more common, the lead role; he is very good and believable as Rob Hall, a climber and adventure consultant from New Zealand who is leading an expedition of less experienced climbers up Mt. Everest. Also on his team are Martin Henderson, Emily Watson and maybe the movie’s MVP, Sam Worthington. I am not a fan of Sam Worthington normally, but here he’s really good at taking a supporting part and giving it some weight and star power. Maybe he’s just not cut out to be a leading man in the movie but rather a valuable supporting player. 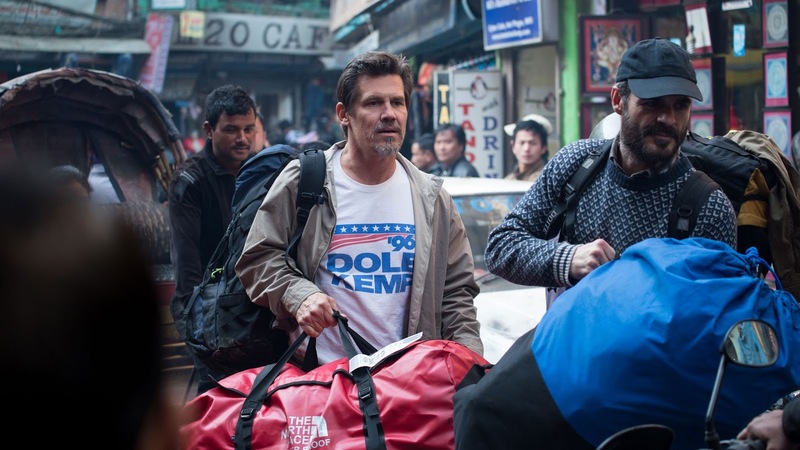 Also in the cast is my boy Jake Gyllenhaal (who is under-utilized), as well as John Hawkes and Josh Brolin who provide their usual solid support. Wasted is the great Keira Knightley, whose role is relegated to being the wife of the Jason Clarke character and whose performance mainly takes place talking into a telephone. But the performances are not what Everest is most focused on, because the grandeur of the mountain and the adventure inherent in the story is what takes center stage. And at that the movie succeeds. I can’t deny that the IMAX 3D photography is beautiful and appropriately harrowing-looking and the set pieces are suspenseful. This is a remorseless movie. When someone dies on the mountain there is no swelling of the score or elongated farewell. Sometimes it’s as simple as a person is in the frame one second and then falls out of the frame the next. It’s very startling. The movie does take its time in the first half to set up the characters so that there should be emotional heft when one of them is killed or badly injured; however, it all comes across as inert when that actually happens. I am having trouble rationalizing why that is, but it is. Maybe it’s just too many characters to keep track of (there is probably a dozen or more climbers) or that they are relatively interchangeable. 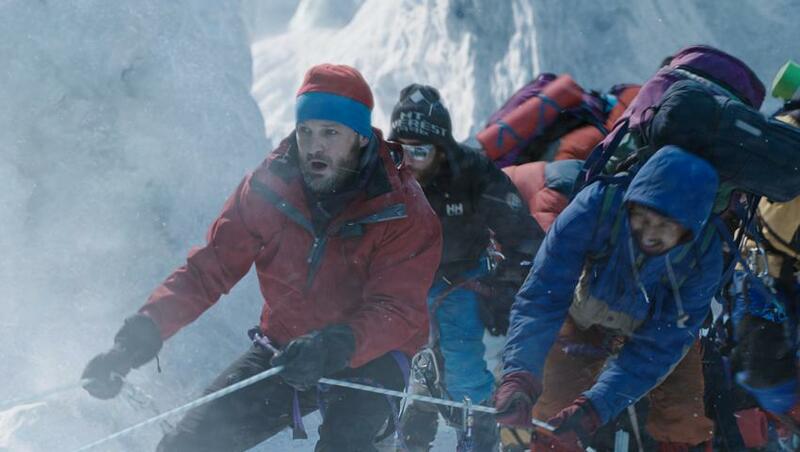 Everest has been criticized as owing just as much to a '70s disaster movie as it does a movie like The Perfect Storm, which did a solid job of balancing the emotional stakes with the spectacle. For the most part Everest does the same. However (as I said earlier), the movie has not stuck with me in the slightest. Everest is a major improvement for its director Baltasar Kormakur (Contraband, 2 Guns) and I was impressed with his work here in comparison to his previous efforts. He knows how to effectively stage an action sequence and he’s pretty good at handling actors and giving them space to do their thing. 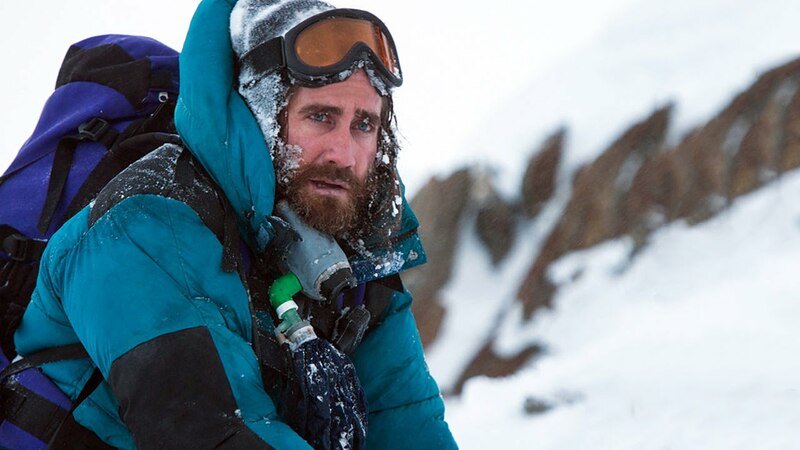 Based on Everest, I’m interested in seeing what he does next. I’m just so lukewarm in my appreciation and enthusiasm for this “good” movie. I don’t get it. As we enter the Fall movie season (aka “the Oscar season”) I have primed myself to be blown away by these big dramas. When they aren’t great, they often feel like a disappointment, which is unfair. I had the same reaction to this weekend’s Black Mass as I did Everest – good, but a letdown because they’re not all-timers. So, I guess the problem is with me and my expectations and not the movie. Is Everest worth your time? Yes, and I would see it in IMAX 3D. It features photography and depth of field you can’t replace on most TVs. I had a similar reaction, but would rate it meh rather than good. Everest reminds me of last year's When the Game Stands Tall as an earnest depiction of true events with too many characters, on-the-nose dialog, and clumsy storytelling. The movie has an artificiality to it; an arms-reach depiction of events with actors occupying placeholder roles rather than feeling like real people. Only a few shots captured the impressiveness of the setting, and one of those shots is used twice. Ultimately, the story plays like a series of set pieces. I once heard a public speaker talking about their climb up Mt Everest and it was fascinating especially the details of how they had to go up and then back to base camp and then up some more and back to base camp etc. I would love to have seen a movie about a successful expedition up Mt. Everest. There should be enough drama to mine from that I would think. Agreed. The movie didn't leave much of an impression regarding many aspects of the climb. It motivates me to revisit the 1998 IMAX documentary. I rewatched the 1998 IMAX documentary Everest for the first time in many years and enjoyed it more than the current release. The cinematography and score work better for me than the movie. The principals read their voice-overs somewhat awkwardly, but the extra features make up for it with candid interviews and video logs. I wanted to see this because I felt like the cast sounded fairly impressive. It doesn't sound like that's a strong enough reason to get myself out to the theater, though. I think I'll probably be alright waiting for Netflix on this one. I definitely don't need to see it in IMAX 3D. It's now an inside joke between me and one of my friends to just randomly quote this movie's trailer. We've both seen it 5 billion times now because it plays in front of EVERY MOVIE. Much like before Amazing Spider-man 2 came out, I'm completely sick of this movie and I've never seen it. When I read Into Thin Air I had the the same feeling of impersonal accounting of the deaths that occurred on the expedition. I suppose it's not an uncommon trait for those that participate in an activity where it's routine to pass by frozen remains on your way to the summit. Doesn't lend itself to character investment within a story however. No need to wait for what Baltasar Kormakur does next, check out what he did prior to this instead - he seems to be a bit of an auteur when it comes to stories involving man against nature (I guess that's what happens when you're an hombre from Iceland). The movie to really check out is "The Deep" (2012), which he made back home in Iceland, a brutal but apparently true story of a fisherman who survives a boat accident in freezing waters against all medical and physical odds. "2 Guns" and "Contraband" seems like paycheck stuff to me, and perhaps career moves; "Everest" must be much closer to his heart. I think if you've seen "The Deep" you can understand his investment in the story and the fascination and resepct for nature's awesomeness that joins the two films together. Also, just like with "The Deep", I think "Everest" isn't meant to be a "disaster movie" but a very straight and realistic depiction of this particular climb - that's perhaps why it can also be seen as kind of "forgettable" as a story, because of course real humans aren't as operatic as characters in Hollywood movies and reality has no narrative. I believe the reception of the movie is corrupted somewhat by the familiarity of the disaster movie genre, and the necessity to make the connection that "ah but wait, isn't this still very similar to any old disaster movie" (because there's both people and a disaster in the movie, I guess), when you could be more forgiving. There's the famous faces - there for marquee value, sure, but also (mainly) because the movie would never have been made without them - and they're never "star-acting", Kormakur insists on making them authentic people (once again, the naturalistic acting style is similar to the one used by the unknown Icelandic actors in "The Deep"). At least to me, because of this, "Everest" felt more personal than I think it did to Riske (and others). I saw Everest yesterday, right after watching The Visit. I also think it´s a good movie. I was never bored, but I will have forgotten it in a few days. As much as I like Kormakur´s non-showy approach, I wished he had filmed this a little more operatic, maybe a little more manipulative. By the way, I had the same problems with Kormakurs The Deep. As it is now, I wasn´t moved by any of the deaths or the hardship they endured. To me the only moving scene was when the remaining guys reach the base camp where Emily Watson awaits them. I appreciate the technical skill, the fine performances, the crisp cinematography and also Kormakurs restraint, but this is a movie, no documentary and I would have preferred this to have more drama and emotion. I also may have a problem feeling bad for the fate of some guys, who start their journey claiming that the human body is not made for the operating altitude of a 747. To me the best and most gripping mountain movie remains Frank Marshalls Alive from 1993. I applaud Working Title for breaking new ground and not sticking to the 'Into Thin Air' version of the 1996 Everest tragedy, which is maybe why this book is not in this film's Credits, something that has not gone unnoticed by some professional reviewers.